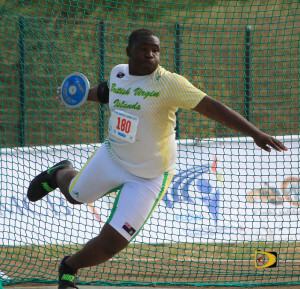 WILLEMSTAD, Curacao—Djimon Gumbs earned Discus Throw and Shot Put silver medals, to lead the BVI’s tally of six at the 46th Carifta Games that wrapped up at the Ergilio Hato Stadium in Willemstad, Curacao on Sunday night. It was the second best tally behind eight medals won in 2012 over the three days of competition targeting the region’s best U18 and U20 Boys and Girls. Gumbs, who won silver on Sunday in the Shot Put on his final attempt, unleashed a mammoth personal best in the third round to grab the Under 18 Boys Discus Throw silver, after placing fifth last year. After fouling his first two attempts, Gumbs unearthed a 60.43m (198’3¼”) effort to eclipse the 55.51m (182’1½”) he threw earlier in the season. Twin brother Diamante was ninth with a personal best of 44.71m (146’8½”). Akira Phillips bagged the BVI’s third silver in the U20 Girls Javelin Throw on Monday afternoon, with her heave of 44.63m (146’ 5”). Her effort smashed Brittney Peters’ national mark of 42.08m (138’0¾ inches), from February 25 this year. Arianna Hayde, got the final day of action rolling with an U18 Girls Javelin Throw bronze medal. Hayde, who was sixth in the seven event Heptathlon that wrapped up two days of competition on Sunday, battled a sore arm and gusty winds that saw several of her throws landing outside the sector. Her opening throw of 41.90m (137’5½”) stood up for the bronze. Shyiniah Caul, L’T’Sha Fahie, Kala Penn and Sh’Kaida Lavacia combined on the U20 Girls 4x400m relay to run 3 minutes, 53.04 seconds for the bronze. Penn an ASA College freshman who won the other bronze in the Triple Jump on Saturday,by cutting the sand at 12.73m (41’9¼”) on her final attempt, settled for fourth in the U20 Girls Long Jump on Monday, with a leap of 5.78m (18’11½”). BVI’s U18 Girls 1600m Relay team of Tashira Edwards, Zara Brown, Akrisa Eristee and DeFreitas, were fourth in 3 minutes 50.01 seconds, while Brown, DeFreitas, Malone and Eristee, finished fifth in the 4x100m Relay with a time of 49.87 seconds. The BU18 Boys 4x400m foursome of Joshua Hill, Rakeel Jack, Jelani Norman and Malik John, slightly improved the 3 minutes 24.96 seconds Youth Record they established in the prelims with a time of 3:24.67, to finish fourth in the final. In the U20 Boys 4x400m m Relay, the quartet of K’Cei Moses, Johnt’a Charles, Deron Leslie and Gevon Smith, were fourth in 3 minutes, 27.24 seconds. The BVI’s Rikkoi Brathwaite became the territory’s first U20 Boys 100m finalist in 41 years of attending the championships, when he finished fifth in 10.71 seconds after placing third in his semifinal in 10.76. Xiomara “Gia” Malone was sixth in the U18 Girls 100m Hurdles running into a -2.1 meters per second wind, finishing with a time of 15.02 seconds. DeFreitas, fourth in the in the U18 Girls 200m last year, finished an unlooked for sixth place in 24.25 seconds.